Jesús lost his mother shortly after reporting to Mariners spring training in 2015…he left the team briefly to attend her funeral, then returned to Arizona and won a spot on the Opening Day roster…he requested to start on Mother's Day that year in her honor…in that game, he recorded his first hit of the season, made an over-the-railing catch in foul territory and was behind the plate for the 2,000th strikeout of Félix Hernández's career... Jesús is one of seven positional players to pitch in a game for the Rays…he has made 3 apps in his major league career, totaling 8 hits, 6 R/ER, 2 BB, 0 SO and 1 HR in 3 IP... In his 44th career start, he caught Hisashi Iwakuma's no-hitter on Aug 12, 2015 vs. BAL. Spent the entire season on the Rays active roster, his first full season in the majors…established career highs with 7 HR and 29 RBI, both more than his career totals from 2013-16 with Seattle… his 20 runs and 45 hits were also career highs... Appeared in 62 games and made 50 starts at catcher…threw out 26.9 pct. (7 of 26) of attempted base stealers, slightly better than the major league average in 2017 (23.0 pct. )…his 3 catcher pickoffs tied for most in the AL and tied Toby Hall (2005) for the club record... Hit 3 HR in his last 8 games, compared to 5 HR in his first 54 games of the season…Wilson Ramos (11), Derek Norris (9) and Sucre (7) made the Rays the third AL team with three catchers (min. 50 pct. of games there) with 7 HR or more, along with the 1994 Yankees and 1970 Athletics... Was batting .458 (11-for-24) with RISP through June 9, but hit .053 (1-for-19) with RISP after that…ended the season batting .279 with RISP and .298 with runners on base, compared to .217 with the bases empty... Recorded 23 of his 29 RBI out of the No. 9 spot in the batting order, 6th in the majors... Made his second career Opening Day roster, first since 2015…was one of a club-record four non-roster invites to make the Opening Day roster, along with Peter Bourjos, Tommy Hunter and Rickie Weeks Jr... On April 9 vs. TOR, his first hit as a Ray was his third career homer and the first of his career on an 0-2 pitch, the first Rays catcher to do that since Curt Casali on Aug 18, 2015 at HOU... On April 26 at BAL, recorded his first career extra-innings hit, scoring Logan Morrison to give the Rays a 4-3, 11th-inning lead…it was the first time a Rays catcher delivered a go-ahead hit in the 11th inning or later since Robinson Chirinos hit a walk-off single in the 12th inning on Aug 4, 2011 vs. TOR... On June 20 vs. CIN, the maximum height on his 4th-inning homer was 38 feet, according to StatCast…it was the sixth time in the StatCast era (since 2015) that an over-the-fence homer stayed that low.... On July 8 vs. BOS, became the first Rays catcher to drive in the only run of a 1-0 win since Ryan Hanigan on Sep 12, 2014 at TOR.... In a 14-7 loss on July 31 at HOU, made his third career pitching app (also Aug 15, 2015 at BOS and June 12, 2015 at HOU)…threw 31 pitches in the 8th inning (1-IP, 2-H, 3-ER, 2-BB)…it was the seventh time in club history a position player pitched, first since Taylor Motter on July 1, 2016 vs. DET... On Sep 17 vs. BOS, hit the second go-ahead homer of his career (also Sep 25, 2016 at MIN)… the 6th-inning solo shot was the decisive run in a 3-2 win. The Totals - Hit .157 (20x127) with 9 runs, 6 doubles, 1 home run & 7 RBI in 50 games with Seattle. ... Making Contact - Hit .267 (12x45) with 4 runs, 4 doubles, and 3 RBI in his final 19 games…hit .098 (8x82) in his first 31 games. ... No-No - Became 5th Mariners catcher to catch a no-hitter on Aug. 11 (Hisashi Iwakuma). ... Defensively - Made 29 of his 43 starts behind the plate from Aug. 1 through the end of the season…Seattle was 20-23 in his 43 starts; was 15-6 in a 21-game streak Aug. 2-Sept. 22 but was 1-7 in his final 8 starts. ... The Hose - Threw out 10 of 23 attempted base stealers (43.5% CS rate), the highest CS percentage in MLB amongst catchers with at least 20 SB attempts…ranks ahead of Russell Martin (25 CCS, 40 SB, 38.5 CS%) and James McCann (24 CCS, 41 SB, 36.9 CS%). ... Sacrifice - Ranked T3rd in the Amerian League with 9 sacrifice hits behind Francisco Lindor, 13) & Alcides Escobar (11)…also tied for 3rd-most by a Mariners catcher, trailing 11 (2000) and 10 (1999) by Dan Wilson, 9 by Larry Cox (1980) and Bob Kearney (1984, 1986). ... He Pitches Too! - Made two relief appearances: June 12 at Houston, tossing shutout 8th inning…allowed first batter to reach base with single before getting double play and groundout to short to end inning & Aug. 15, allowing 3 runs (1 HR) at Boston. ... Opening Day - Named to the Opening Day roster for the first time in his career. ... Up & Down - Had two stints with Seattle, making the Opening Day roster before being sent to minors on May 19 (recalled on June 4). ... AAA Tacoma - Hit .261 (6x23) with 3 runs and 2 RBI in 6 games with AAA Tacoma. ... Injury - Fractured right fibula during winter ball in Venezuela Jan. 17, 2016…had surgery to repair damage in right ankle Jan. 26, 2016 in Seattle by Dr. Ed Khalfayan. Appeared in 21 games, making 18 starts (all at catcher), while hitting .213 (13x61)with 4 runs, 2 doubles and 5 RBI. Began his MLB season hitting .138 (4x29) in his ﬁrst 9 games before hitting .391 (9x23) inhis next 7 games (Aug. 20-Sept. 7) but ﬁnished 0x9 in last 5 games... Seattle was 11-7 in his 18 starts behind the plate including 11-3 in his ﬁrst14 starts... Began the season with Triple-A Tacoma before being recalled on July 8 (John Buck DFA)... With Triple-A Tacoma hit .274 (48x175) with 13 runs, 7 doubles, 1 triple, 2 homeruns and 16 RBI in 48 games... In his ﬁnal 10 games with Tacoma, hit .375 (15x40) with 5 doubles, ahome run and 2 RBI... Threw out 21 of the 41 attempted base stealers in the minors. Appeared in 8 games before injuring his wrist June 4 vs. Chicago (AL)…went on the DL two days later and did not play with the Mariners the rest of the season. Made his MLB debut May 24 vs. Texas, hitting a single off Joseph Ortiz in the 9th inning. On the disabled list June 8-Aug. 16 with a left wrist bone contusion. Played 23 games with the Rainiers, hitting .299 (26x87) with 3 doubles and 8 RBI. Played for Leones del Caracas in the Venezuelan Winter League. Spent entire season with AA Jackson...played in the Southern League All-Star gameand named a postseason Southern League All-Star...led all SL catchers with a .271(87x321) batting average...was the only qualifying catcher in the league to not commitan error (769 TC)...threw out 44.4% of attempted base stealers (32 CS, 77 ATT)...batted.318 (27x85) vs. LHP, compared to .254 (60x236) vs. RHP...hit .329 (24x73) with 11 RBI inMay...played for Caracas in the Venezuelan Winter League. Spent the entire season in the Southern League, but split time between AA affiliates with Atlanta (Mississippi) and Seattle (Jackson) organizations...hit .219 (30x137) in 40 games with Mississippi ... released by the Braves on July 14 and signed with Seattle as a Minor League free agent on July 19 ... appeared in 32 games for Jackson, batting .214(18x84) with 1 home run and 9 RBI ... combined to throw out 31 of 60 attempted base stealers (51.7%). Began the season with Myrtle Beach (High-A) before being promoted to Mississippi (AA) in mid-June...Hit safely in 19 of his first 22 games with Mississippi, including nine multi-hit efforts and hit .360 (31-for-86) with 10 doubles during that stretch...Combined to hit .253 (85-for-336) with seven home runs and 34 RBI between Myrtle Beach and Mississippi...His seven combined home runs were a career high. Split time between Rome (A) and Myrtle Beach (A)...Hit .325 (55-for-169) with Rome in 45 games...With Rome, hit .450 (18-for-40) vs. lefties and hit .287 (37-for-129) against right handers...Was promoted on 6/25 to Myrtle Beach and went 1-for-4 at Lynchburg...With Myrtle Beach, hit .429 (9-for-21) as a designated hitter and .241 (42-for-174) at catcher...For the Pelicans, twice recorded three-hit games (8/6 vs. LYN and 9/4 vs. Winston Salem)...His six combined home runs and 38 combined RBI were both professional highs...Was named Rome's Player of the Month for May (.389, 1 HR, 8 2B, 10 RBI). Started 34 games at catcher and hit .182 (28-for-154) in first full season at Danville...Was a perfect3-for-3 with one RBI 8/3 at PUL. Played the entire season for the GCL Braves and appeared in 40 games, 33 as catcher...Made hisfirst professional appearances at positions other than catcher or DH (appeared in 1 game each at 2B and 3B). Named by the organization as the DSL Player of the Year as well as Player of the Month for July (.388,19-for-49, 10 R, 5 2B, 8 RBI, 6 BB, 0 K) and August (.222, 8-for-36, 5 R, HR, 5 RBI). Signed as a non-drafted free agent on 5/25 and appeared in 19 games for the DSL Braves. March 25, 2019 Baltimore Orioles selected the contract of C Jesus Sucre from Norfolk Tides. February 18, 2019 C Jesus Sucre assigned to Norfolk Tides. 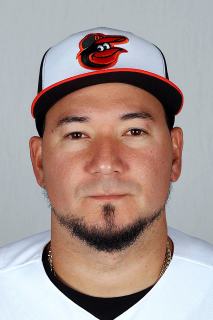 February 5, 2019 Baltimore Orioles signed free agent C Jesus Sucre to a minor league contract and invited him to spring training. November 5, 2018 C Jesus Sucre elected free agency. November 5, 2018 C Jesus Sucre assigned to Navegantes del Magallanes. November 1, 2018 Tampa Bay Rays sent C Jesus Sucre outright to Durham Bulls. November 5, 2017 C Jesus Sucre assigned to Navegantes del Magallanes. April 1, 2017 Tampa Bay Rays selected the contract of C Jesus Sucre from Durham Bulls. February 25, 2017 C Jesus Sucre assigned to Tampa Bay Rays. February 8, 2017 Seattle Mariners traded C Jesus Sucre to Tampa Bay Rays for Player To Be Named Later. February 8, 2017 C Jesus Sucre assigned to Durham Bulls. February 1, 2017 Seattle Mariners sent C Jesus Sucre outright to Tacoma Rainiers. February 1, 2017 Seattle Mariners invited non-roster C Jesus Sucre to spring training. January 26, 2017 Seattle Mariners designated Jesus Sucre for assignment. December 30, 2016 Navegantes del Magallanes traded C Jesus Sucre to Tiburones de La Guaira. September 2, 2016 Seattle Mariners recalled C Jesus Sucre from Tacoma Rainiers. July 20, 2016 Seattle Mariners optioned C Jesus Sucre to Tacoma Rainiers. July 6, 2016 Jesus Sucre roster status changed by Seattle Mariners. June 27, 2016 Seattle Mariners sent C Jesus Sucre on a rehab assignment to Tacoma Rainiers. June 20, 2016 Seattle Mariners sent C Jesus Sucre on a rehab assignment to AZL Mariners. March 1, 2016 Seattle Mariners placed C Jesus Sucre on the 60-day disabled list. September 26, 2015 C Jesus Sucre assigned to Navegantes del Magallanes. June 4, 2015 Seattle Mariners recalled C Jesus Sucre from Tacoma Rainiers. May 20, 2015 Seattle Mariners optioned C Jesus Sucre to Tacoma Rainiers. November 11, 2014 C Jesus Sucre assigned to Leones del Caracas. July 8, 2014 Seattle Mariners recalled Jesus Sucre from Tacoma Rainiers. March 11, 2014 Seattle Mariners optioned C Jesus Sucre to Tacoma Rainiers. September 30, 2013 Seattle Mariners recalled Jesus Sucre from Tacoma Rainiers. August 17, 2013 Seattle Mariners optioned Jesus Sucre to Tacoma Rainiers. August 17, 2013 Jesus Sucre roster status changed by Seattle Mariners. August 8, 2013 Seattle Mariners sent C Jesus Sucre on a rehab assignment to AZL Mariners. June 8, 2013 Jesus Sucre roster status changed by Seattle Mariners. May 24, 2013 Seattle Mariners selected the contract of C Jesus Sucre from Tacoma Rainiers. November 14, 2012 Seattle Mariners signed free agent C Jesus Sucre to a minor league contract and invited him to spring training. November 2, 2012 C Jesus Sucre elected free agency. September 26, 2012 C Jesus Sucre assigned to Leones del Caracas. January 26, 2012 Seattle Mariners invited non-roster C Jesus Sucre to spring training. July 20, 2011 C Jesus Sucre assigned to Jackson Generals from Seattle Mariners. July 19, 2011 Seattle Mariners signed free agent C Jesus Sucre to a minor league contract. July 14, 2011 Mississippi Braves released C Jesus Sucre. May 23, 2011 Mississippi Braves activated C Jesus Sucre from the 7-day disabled list. May 16, 2011 Mississippi Braves placed C Jesus Sucre on the 7-day disabled list. Sprained right ankle. February 2, 2011 Atlanta Braves invited non-roster C Jesus Sucre to spring training. October 8, 2010 C Jesus Sucre assigned to Leones del Caracas. June 16, 2010 C Jesus Sucre assigned to Mississippi Braves from Myrtle Beach Pelicans. February 17, 2010 Atlanta Braves invited non-roster C Jesus Sucre to spring training. November 26, 2009 C Jesus Sucre assigned to Leones del Caracas. June 25, 2009 Jesus Sucre assigned to Myrtle Beach Pelicans from Rome Braves.